The Li River boat trip is one of our planet's most stunningly beautiful journeys. 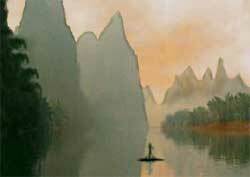 The smooth water exquisitely mirrors a fairy-tale landscape of conical peaks reaching for the sky (see photo). These limestone peaks are the vestiges of eroded ancient sea beds. The word Li is pronounced lee. There's something interesting to see from your Li River cruise boat along the banks of almost every bend of the river. You view graceful bamboo groves, farmers tending rice paddies, and lumbering water buffalos pulling carts or cooling off in the river. Another interesting sidelight is seeing fishermen gliding on the Li River on narrow bamboo rafts. Some use tethered cormorant birds to catch fish.